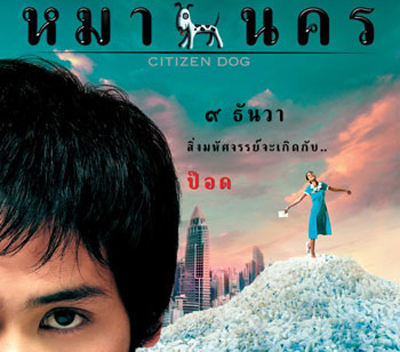 Tomorrow, the Thai Film Archive (in Salaya, near Bangkok) will screen Wisit Sasanatieng's film Citizen Dog. This whimsical romantic comedy retains the over-saturated colours of Wisit's debut film, the incredible Tears Of The Black Tiger (screened at the Archive in 2009 and 2010). After Citizen Dog, Wisit directed more mainstream projects: the horror film The Unseeable (featured in Spirits) and the action movie The Red Eagle (screened at Movies On The Beach). Wisit has also made the short film Norasinghavatar (part of the Traces Of Siamese Smile exhibition), the music video เราเป็นคนไทย, and a segment of the portmanteau film Sawasdee Bangkok. He wrote the scripts for Nonzee Nimibutr's Nang Nak and 2499, wrote the outline for Kongkiat Khomsiri's Slice, appeared at the 28 Days festival, and designed the posters for the 2008 and 2009 Bangkok International Film Festivals. Currently, he is working with Thunska Pansittivorakul on the forthcoming film Supernatural.